The Hershey Company, a leading producer of quality chocolate and confectionery all around the world, launched its latest chocolate product last January 19 of the current year. Labeled as Hershey’s Drops, this new product is the snack version of Hershey’s classic milk chocolate and cookies ’n crème. Available in classic milk chocolate and cookies’ n crème flavors, this new product does not have a candy shell. 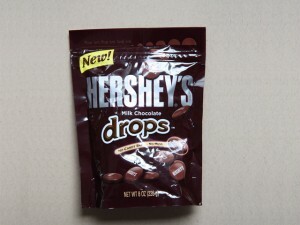 Instead, these bite-sized drops have a shiny finish that protects the chocolate from becoming a mess in your hands. This no-mess chocolate makes it perfect for snacking anytime, anywhere. Whether it be on a movie night or in a carpool drive anywhere, Hershey®’s Drops are very convenient to enjoy. Everyone will be able to share and enjoy the classic deliciousness of Hershey’s classic flavors in whatever occasion. According to Anna Lingeris, the company’s spokesperson, Hershey came up with this new product, keeping in mind the huge number of people who continually patronize Hershey’s two most loved flavors. With Hershey®’s Drops, the company can now provide Hershey’s chocolate lovers with a easily eaten version of that chocolate flavor that they have always enjoyed. This new chocolate product is packed in standup pouches that are re-sealable and are sold in 8-ounce sizes. The re-sealable pouch serves to keep the chocolate delicious and fresh. The milk chocolate drops variety will also be sold in king sizes.